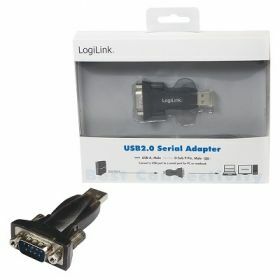 This compact adapter from LogiLink allows the operation of serial (COM port also called RS232 interfaces) devices to the USB 2.0 port. Ideal for operating serial end devices such as modems or ISDN adapters and older hardware to newer generations of notebooks and PCs that have no serial port. A 80cm USB extension cable is included.